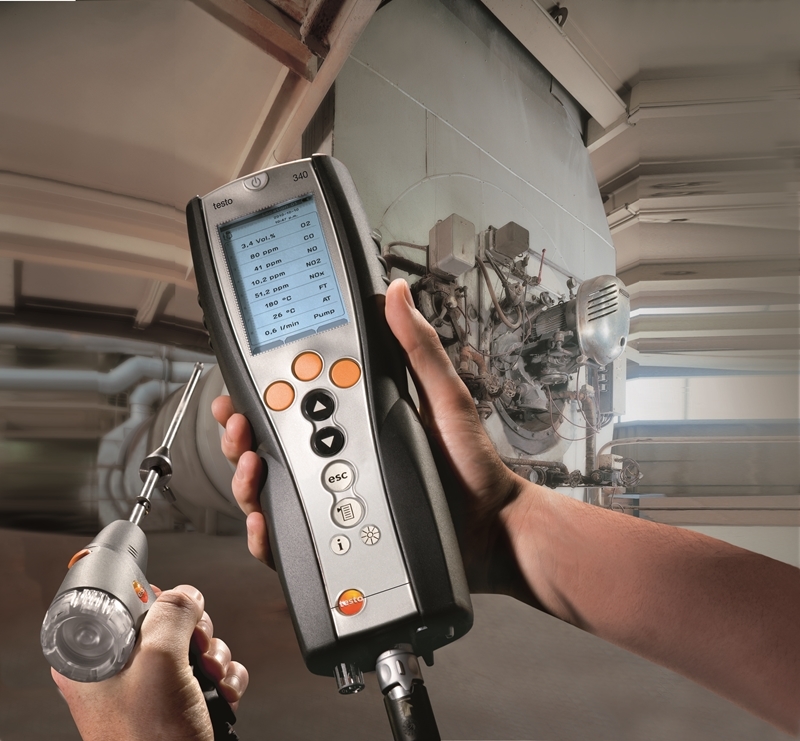 Many service engineers rely on the testo 340 for industrial boiler tuning and testing. When it comes to industrial boiler maintenance, experienced technicians know that testing and servicing is about more than just checking fuel supply and emission values. Combustion plays a vital role in curbing energy costs, ensuring emission compliance and extending the longevity of the equipment. Whether it be a new system or one nearing the end of its lifecycle, maintaining the equipment to ensure everything from blower to the air ducts is operating in a coordinated fashion is the key to a well functioning boiler; which is why many servicing engineers are opting for digital tools like the testo 340 flue gas analyser for testing. Throughout the course of 30 to 40 years industrial boilers need to be tuned multiple times to ensure the combustion technology is working properly. With increasing emission level restrictions and a focus on reduced energy usage, the job has never demanded more precise readings. Industrial boiler maintenance requires accurate flue gas measurements. Information for troubleshooting issues and regular servicing. Insight into how to improve burner performance. All of these readings are vital to gaining the financial and operational benefits many facility managers strive for – as well as ensuring the system is functioning efficiently. A digital revolution is underway in the sector and the testo 340 flue gas analyser is emerging as an ideal instrument for any servicing engineer. What once took multiple tools is now accomplished with one; the device is able to accurately measure relevant gases like carbon dioxide, oxygen and NOX quickly and provide reports through its Bluetooth smartphone app. The testo 340 is a reliable and accurate flue gas analyser. Extendable 7.8 metre hose connection for flue gas ducts that are hard to reach. Pre-calibrated interchangeable sensors eliminate downtime. Self-cleaning PTFE hose eradicates condensate and dirt particle build-up. Quick and accurate measurements due to low-maintenance technology. All of this allows technicians to efficiently tune and test industrial boilers without the drawbacks that are typically associated with the process, such as high flue gas loss or pressure measurement values. With emission level compliance always changing and boiler equipment dating, service engineers can be sure they have the right measurements and readings with a digital tool like the testo 340 flue gas analyser. Contact a Testo representative today to learn more.